Sci-fi, it seems, isn’t too popular with young adult publishers right now. A shame really, as space operas feature some of the most intriguing ideas. 172 Hours on the Moon bucks this trend: translated from the original Norwegian 172 Timer Pa Manen, and though it is not a space opera, it is very much a sci-fi novel with heavy horror elements. The initial concept itself is a good one: send three teenagers to the moon as a PR stunt on NASA’s behalf, keep them there for a week and then bring them back to Earth. All good and solid material to work with and introduce some dilemmas and problems into. But somewhere it went wrong. 172 Hours on the Moon takes its time gaining momentum, to say the least. Over one hundred pages are spent introducing the concept, the thee or four main characters and briefly summarising the training the three teenagers receive. Yet, it feels like Johan Harstad does not utilise the situations he brings his characters in to their full extent. Harstad had two options when writing this: skim over the how and why of the moon mission and concentrate on the actual mission, or add perhaps another hundred pages and really flesh out the characters and bring them to life. Unfortunately, he chooses the former- and he misses out some prime character-moments that would really have added an extra dimension to Mia, Midoria and Antoine. As it is, I never really connected with any of the three, and I was left a little stranded. Every book has its moment, and 172 Hours on the Moon is no different. The novel reaches its peak about half way through, when Harstad really begins to push the horror/spooky side of things. And whilst the climax is short (under fifty pages), it is terrifying and left me in a state of unrest for several hours. Not many books can do that. From there on in, things just fall apart. Harstad kills of too many characters too quickly, and it doesn’t help that I was never fully invested in them anyway. 172 Hours on the Moon transitions very quickly from a remotely possible, creepy sci-fi novel to a plain weird, crazy story bounding out of control. The change is jarring. As well as that, the end left a bitter taste in my mouth- one of disappointment and a general feeling of unease. I was left wondering why I had spent the last couple of hours reading 172 Hours on the Moon. And that’s a bad sign. I am moderately aware that 172 Hours on the Moon was critically acclaimed in Harstad’s native Norway. I am also aware that I read an advanced copy of the novel- one that was riddled with odd little phrases and sentences that can only come from a translation. So perhaps, 172 Hours on the Moon is better in its native Norwegian- just as the author intended it to be- but that still doesn’t solve the problems I had with the actual plot. Every so often you come across a novel that you want to like but inevitably, you can’t. I’m afraid that my reading of 172 Hours on the Moon left me with that feeling. Harstad faces us with such a great idea- and then the whole thing comes apart when it comes to the actual technicalities of writing. Some of these, like the rawness of the translation (which I hope the publishers brush up before publication) are due to the fact that this novel was not written in English. Others are undeniably faults with the plot- the lack of good character development and the odd twist three quarters of the way through when the novel takes such an unexpected and odd turn that doesn’t suit the previous couple of hundred pages. So perhaps 172 Hours on the Moon is a good book, and perhaps I was in the wrong mood to be reading it, and the translation errors and everything else just built up to ruin my experience of reading it. 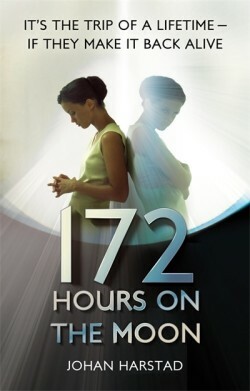 But I can’t help but feel that 172 Hours is a lot weaker than I expected it to be. What did you think about 172 Hours on the Moon? I just finished this book. It didn’t really scare me since it’s hard to get me scared since I watch a lot of horror movies but this deff wasn’t your typical book. It was pretty freaky. As for what I thought about the book well it was good but I didn’t care for how they ended it. I really wish one or more of them would of survived and been able to tell the world what really happened and shut down NASA. Although it was very predictable. I knew that Mia would be dead and the Doppelgänger was who was in the ship that landed at Earth. This book also left me with a few questions. 1st- What was the point of sending the 3 teenagers into space? Were they just an excuse? Were they there to set off the nukes they had hiding in Darlah 1 to destroy the moon and the creatures on it? 2nd-They never told what Sander wrote to Mia in the letter. What was the point of having that in the story if it never came up? 3rd-In the authors notes, what was the letter Mia wrote in the authors notes? 4th-So now the Doppelgänger will take over Earth and destroy it? Thanks for your comment Jacquelyn! I agree that the ending was a major let down. All in all, I think it was a good idea but that (as you specify) details were not present which made the novel seem rather flimsy and unsatisfying.